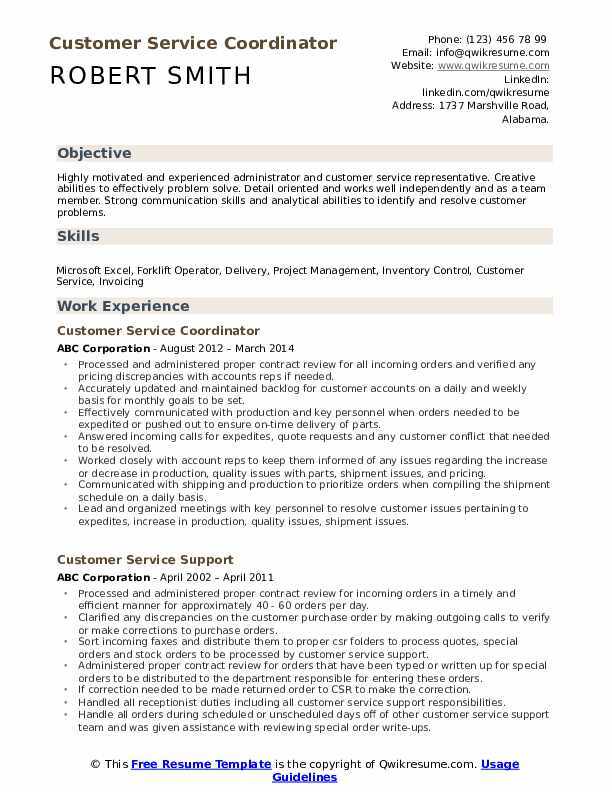 A Customer Service Coordinator will oversee the customer service representatives and also handle various clerical and sales related duties. 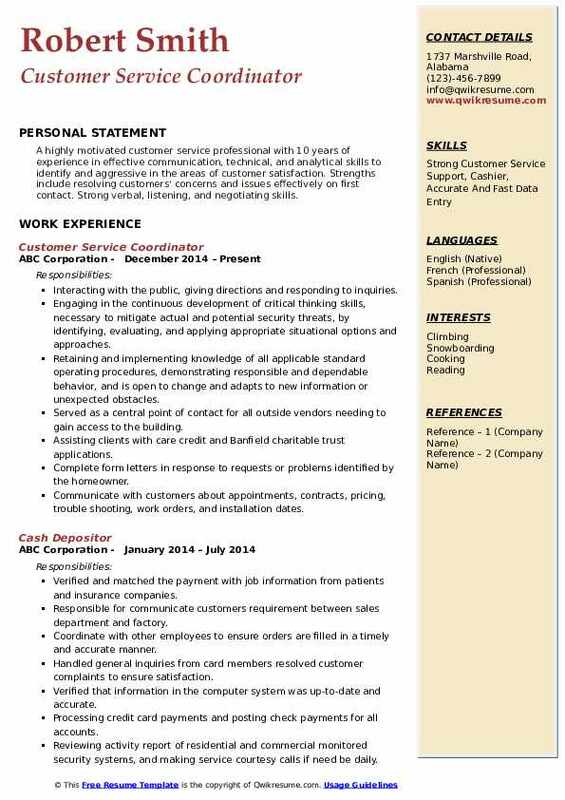 The major roles and responsibilities listed on the Customer Service Coordinator Resume include the following – ensuring customer satisfaction, handling customer inquiries, providing administrative support, handling customer questions or queries, processing phone orders, entering data into database, preparing invoices, providing information about the status of the product or service to the customers; and executing sales and office management duties. Candidates applying for this post should possess strong oral and written communication skills, multitasking abilities and organizational skills; they should be able to handle well the customers’ issues and show proficiency in company’s software and applications. Basic mathematical skills and problem-solving skills are as well needed. Though education requirements vary from employer to employer, a high school diploma or its equivalency is mandatory. 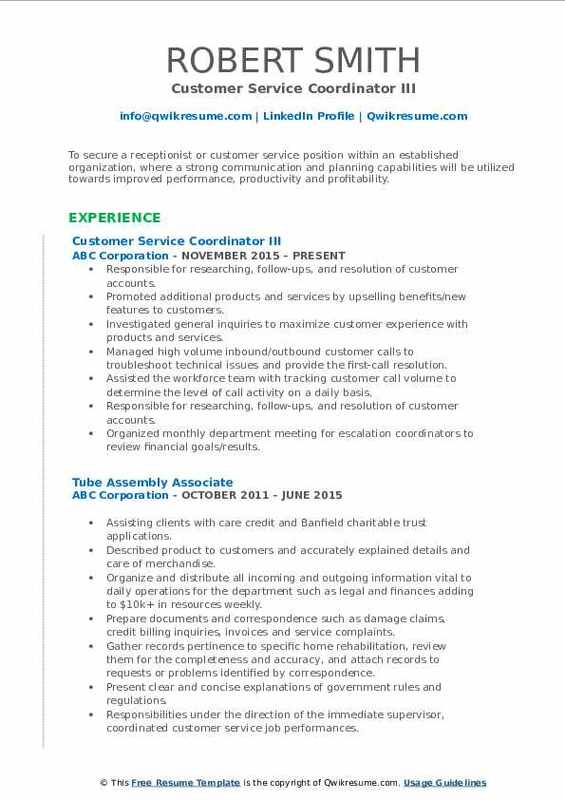 Summary : Highly motivated and experienced administrator and customer service representative. Creative abilities to effectively problem solve. Detail oriented and works well independently and as a team member. Strong communication skills and analytical abilities to identify and resolve customer problems. Processed and administered proper contract review for all incoming orders and verified any pricing discrepancies with accounts reps if needed. Accurately updated and maintained backlog for customer accounts on a daily and weekly basis for monthly goals to be set. Effectively communicated with production and key personnel when orders needed to be expedited or pushed out to ensure on-time delivery of parts. Answered incoming calls for expedites, quote requests and any customer conflict that needed to be resolved. Worked closely with account reps to keep them informed of any issues regarding the increase or decrease in production, quality issues with parts, shipment issues, and pricing. Communicated with shipping and production to prioritize orders when compiling the shipment schedule on a daily basis. Lead and organized meetings with key personnel to resolve customer issues pertaining to expedites, increase in production, quality issues, shipment issues. 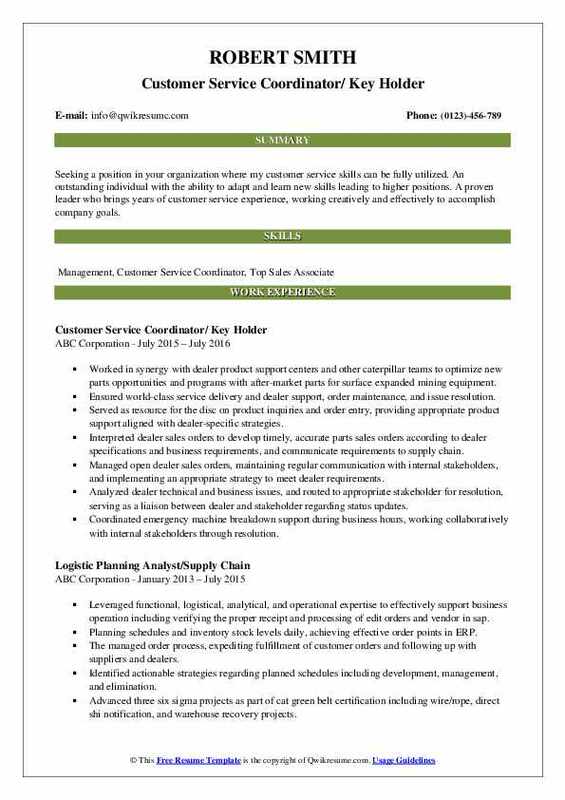 Objective : Seeking a position in your organization where my customer service skills can be fully utilized. An outstanding individual with the ability to adapt and learn new skills leading to higher positions. A proven leader who brings years of customer service experience, working creatively and effectively to accomplish company goals. Worked in synergy with dealer product support centers and other caterpillar teams to optimize new parts opportunities and programs with after-market parts for surface expanded mining equipment. Ensured world-class service delivery and dealer support, order maintenance, and issue resolution. Served as resource for the disc on product inquiries and order entry, providing appropriate product support aligned with dealer-specific strategies. Interpreted dealer sales orders to develop timely, accurate parts sales orders according to dealer specifications and business requirements, and communicate requirements to supply chain. Managed open dealer sales orders, maintaining regular communication with internal stakeholders, and implementing an appropriate strategy to meet dealer requirements. Analyzed dealer technical and business issues, and routed to appropriate stakeholder for resolution, serving as a liaison between dealer and stakeholder regarding status updates. Coordinated emergency machine breakdown support during business hours, working collaboratively with internal stakeholders through resolution. Summary : To secure a receptionist or customer service position within an established organization, where a strong communication and planning capabilities will be utilized towards improved performance, productivity and profitability. 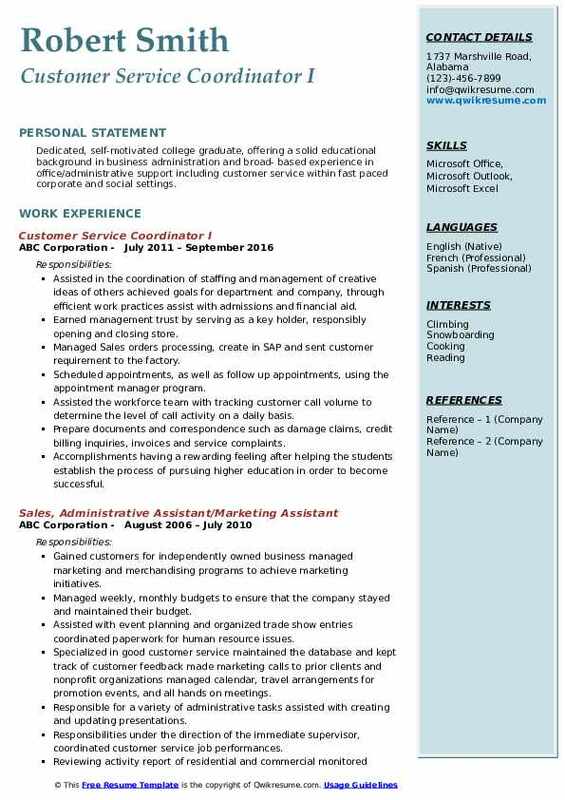 Skills : Excel, Customer Service, Customer Relations, Social Media Marketing, Social Networking, Retention, Email, Email Marketing, Office Management, Customer Relationship Management, Marketing, Administration, Computer, Organization, Organizational Development. Responsible for researching, follow-ups, and resolution of customer accounts. Promoted additional products and services by upselling benefits/new features to customers. Investigated general inquiries to maximize customer experience with products and services. Managed high volume inbound/outbound customer calls to troubleshoot technical issues and provide the first-call resolution. Assisted the workforce team with tracking customer call volume to determine the level of call activity on a daily basis. Organized monthly department meeting for escalation coordinators to review financial goals/results. Managed customer product returns and exchanges, and answered any questions regarding return policy. Responsibilities responsible for interacting with customers to answer inquires about products, accounts, and services. 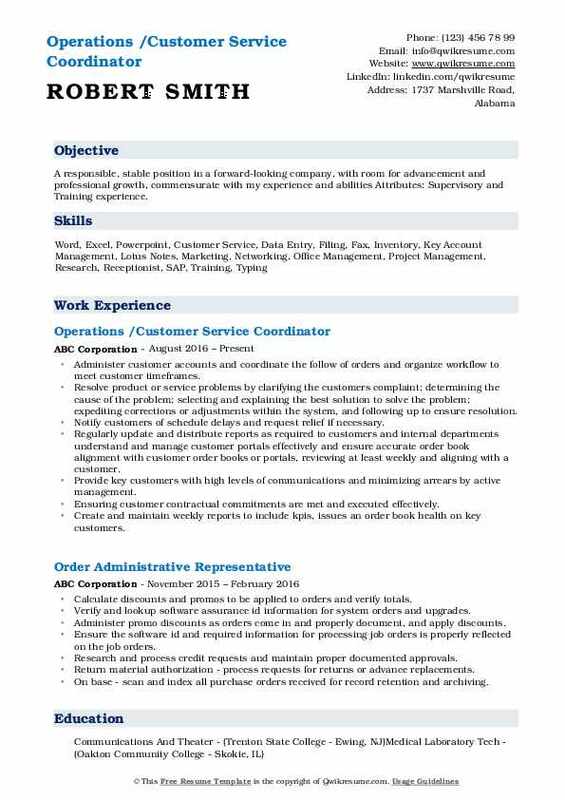 Summary : Dedicated, self-motivated college graduate, offering a solid educational background in business administration and broad- based experience in office/administrative support including customer service within fast paced corporate and social settings. Assisted in the coordination of staffing and management of creative ideas of others achieved goals for department and company, through efficient work practices assist with admissions and financial aid. Earned management trust by serving as a key holder, responsibly opening and closing store. Managed Sales orders processing, create in SAP and sent customer requirement to the factory. Scheduled appointments, as well as follow up appointments, using the appointment manager program. Prepare documents and correspondence such as damage claims, credit billing inquiries, invoices and service complaints. Accomplishments having a rewarding feeling after helping the students establish the process of pursuing higher education in order to become successful. Objective : A responsible, stable position in a forward-looking company, with room for advancement and professional growth, commensurate with my experience and abilities Attributes: Supervisory and Training experience. Administer customer accounts and coordinate the follow of orders and organize workflow to meet customer timeframes. Resolve product or service problems by clarifying the customer's complaint; determining the cause of the problem; selecting and explaining the best solution to solve the problem; expediting corrections or adjustments within the system, and following up to ensure resolution. Notify customers of schedule delays and request relief if necessary. Regularly update and distribute reports as required to customers and internal departments understand and manage customer portals effectively and ensure accurate order book alignment with customer order books or portals, reviewing at least weekly and aligning with a customer. Provide key customers with high levels of communications and minimizing arrears by active management. Ensuring customer contractual commitments are met and executed effectively. Create and maintain weekly reports to include kpi's, issues an order book health on key customers. Summary : Dedicated professional with strong presentation, analytical problem solving skills. Customer -focused, quality-oriented, proactive in resolving issues, exceptional organizational skills, written and communication skills. Skills : Customer Service, Inspection, Quality, Shipping, Data Entry, Inventory, Document Control, Blue Print Reading, Calibration, Supplier Quality. Assist customers daily on account questions such as overall account information, pricing, replacement cost, renewal information etc. 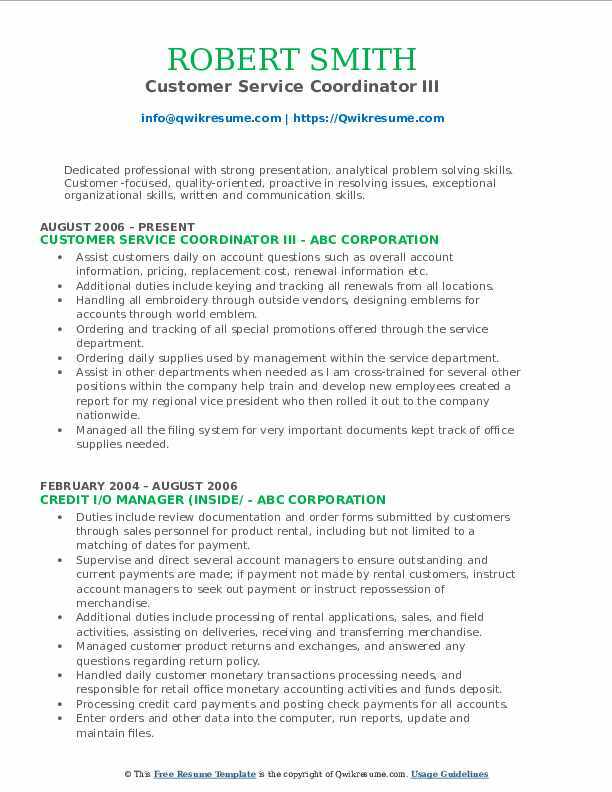 Additional duties include keying and tracking all renewals from all locations. Handling all embroidery through outside vendors, designing emblems for accounts through world emblem. Ordering and tracking of all special promotions offered through the service department. Ordering daily supplies used by management within the service department. Assist in other departments when needed as I am cross-trained for several other positions within the company help train and develop new employees created a report for my regional vice president who then rolled it out to the company nationwide. Managed all the filing system for very important documents kept track of office supplies needed. Headline : Highly motivated, customer focused professional with extensive experience in customer acquisition and retention. Skilled in creating and growing solid customer relationships. Strong ability to perform needs analysis and account tracking. Establish, develop and maintain strong and effective working relationships with internal and external, customers, prospects and visitors to the retail office by providing a consistent quality level of services, which is timely, thorough and responsive to customers and exceeds their expectations. Handled daily customer monetary transactions processing needs, and responsible for retail office monetary accounting activities and funds deposit. Served as a technology resource for the team by assisting with questions regarding new technology, workstations, software and printers. Streamlined the employee training manual for more effective and efficient training. Coordinate the scheduling of document reviews and payment plan options call to get the client started. Primary responsibility is to assist clients with setting up a payment plan to pay off their tax liens. Handled general inquiries from card members resolved customer complaints to ensure satisfaction. 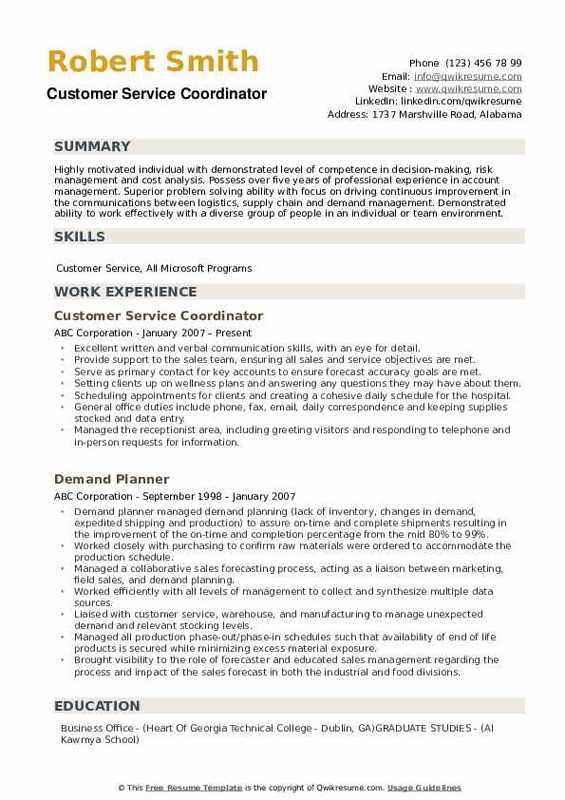 Headline : A highly motivated customer service professional with 10 years of experience in effective communication, technical, and analytical skills to identify and aggressive in the areas of customer satisfaction. Strengths include resolving customers' concerns and issues effectively on first contact. Strong verbal, listening, and negotiating skills. Engaging in the continuous development of critical thinking skills, necessary to mitigate actual and potential security threats, by identifying, evaluating, and applying appropriate situational options and approaches. Assisting clients with care credit and Banfield charitable trust applications. Complete form letters in response to requests or problems identified by the homeowner. Communicate with customers about appointments, contracts, pricing, trouble shooting, work orders, and installation dates. Helped devolved new policies and procedures within the department to bridge the gap between all phone channel on-boarding agents to create a better customer experience. Summary : Highly motivated individual with demonstrated level of competence in decision-making, risk management and cost analysis. 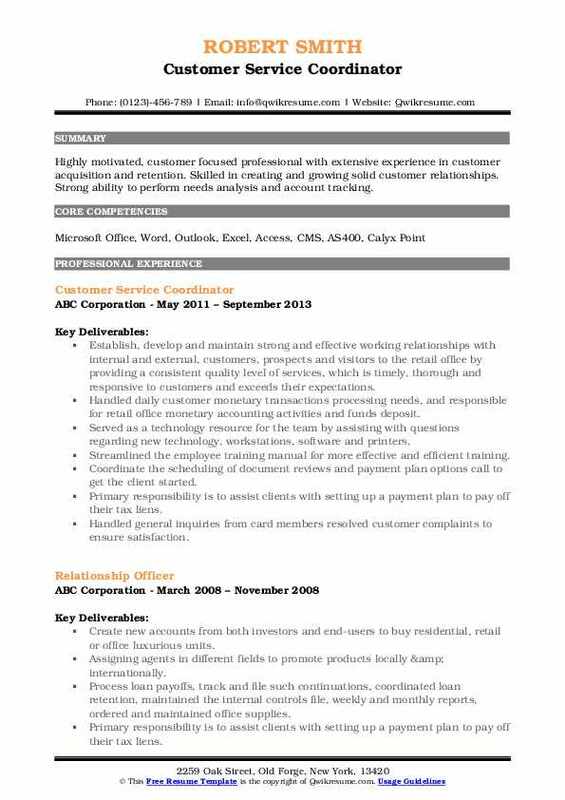 Possess over five years of professional experience in account management. Superior problem solving ability with focus on driving continuous improvement in the communications between logistics, supply chain and demand management. Demonstrated ability to work effectively with a diverse group of people in an individual or team environment. Excellent written and verbal communication skills, with an eye for detail. Provide support to the sales team, ensuring all sales and service objectives are met. Serve as primary contact for key accounts to ensure forecast accuracy goals are met. Setting clients up on wellness plans and answering any questions they may have about them. Scheduling appointments for clients and creating a cohesive daily schedule for the hospital. General office duties include phone, fax, email, daily correspondence and keeping supplies stocked and data entry. Managed high volume inbound/outbound customer calls to troubleshoot issues and provide first-call resolution.